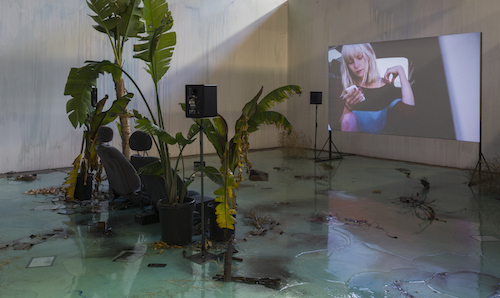 View of “Laure Prouvost: A Way to Leak, Lick, Leek,” 2016. From left: A Way to Leak, Lick, Leek, 2016; Lick in the Past, 2016. The journey begins with a quartet from Laure Prouvost’s series “Exhausted Drawings,” 2015, pencil-on-paper portraits of adolescents with smoking exhaust pipes coming out of their mouths, and Exhausted Map, 2015, a plotting of Los Angeles collaged with found flyers and handwritten annotations. In the main space the floor is obscured beneath a pool of milky blue resin, into which are set cracked eggs and smashed Apple products. This installation, A Way to Leak, Lick, Leek, 2016, suggests physical spillage, but also, through its title’s homophones, a certain leakage in meaning. It evokes the trash-filled shallows of a river while asserting its own materiality. In the accompanying video Lick in the Past, 2016, characters speak seductively about their bodies fossilizing—as though the division between representation and subject is melting away and making a mess of this gallery. The video features a trap song whose lyrics were authored by Prouvost, with the hypnagogic chorus “You are my petrol, my drive, my dream, my exhaust,” which, combined with the semi-improvised ramblings of the cast, takes the genre of bored-LA-teenagers-with-glossy-hip-hop-sound-track movie—think 2013’s Bling Ring—and pushes it into a sort of surreal romantic poetry. Recalling those “Exhausted Drawings,” one wonders whether these kids are having vapor-induced visions like oracles, or just spewing out a pollution of vacant words.